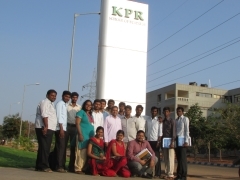 KPR School of Business was the first to have Preparatory programme in the year 2014. The programme was conducted for 4 days from 21.1.2014 to 24.1.2014. The BSchool offered this programme as a value added course for their MBA – Operations Management students. The programme coordinator from the institution end was Ms. S. Gayathri. Their vast and beautiful campus is located at Arasur in the Avinashi road, Coimbatore. In spite of the limited strength, this programme had its own liveliness due to the participation and involvement of young professionals and faculty members. After 4 days, students were excited about their exposure to wide areas of international logistics, procurement and warehousing. For more information on CII Logistics preparatory programmes click here.